We usually think of bacteria as microbes, things that we need to peer down a microscope to see. Well, those white blobs are bacteria big enough to see with your own eyes. Thiomargarita namibiensis is world’s largest bacteria, a gram-negative Proteobacterium found in the ocean sediments off the coast of Namibia. Usually it is 0.1—0.3 mm (100—300 µm) across, but bigger cells have been observed up to 0.75 mm (750 µm). The name for the genus, Thiomargarita, is a contraction of thio (sulphur, from the Greek θεῖον = theion) and the Latin for pearl, margarita. You can see where the “pearl” reference comes from in the photo. The white colour is due to sulphur granules inside the bacteria. The species name namibiensis refers to the fact is was found in Namibia. Not only is Thiomargarita namibiensis a giant but it is also very unusual. It utilizes sulfates and nitrates to get its energy. This bacteria found off the coast of Namibia is in the sediment at the bottom of the ocean. Basically, Thiomargarita namibiensis gets necessary electrons from sulfates. It then uses nitrates to grab onto the electron instead of oxygen. Those electrons are eventually used to generate energy for the cell. It gets its enormous size because it stores huge amounts of nitrates to hold onto these electrons. It needs to store the nitrates because nitrate levels are very low in these waters most of the time. It isn’t until a major storm stirs up the mud at the bottom of the ocean that Thiomargarita namibiensis can get the nitrates it needs. When nitrates are around, these bacteria literally stuff themselves with nitrate. In essence they are a huge ball of nitrates with a very thin layer of cytoplasm (cytoplasm contains all the necessary stuff for bacteria to live, grow, and reproduce) around this nitrate. More recently it has been suggested that some of the most ancient fossil eggs or embryos might not be animal cells, but large bacteria like Thiomargarita. Those with a subscription or institutional access to Nature obtain a copy of the original paper there. The original discovery of was reported in Science and has an associated summary article (you’ll need a subscription to read the full articles of both of these). 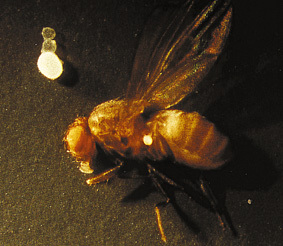 The original article with the photograph is from a research news release from the Max Plank Society for the Advancement of Science in 1999. Malik Wajid Hussain Chan’s teacher was not all that wrong. Epulopiscium fishelsoni was the largest known bacterium before the discovery of Thiomargarita namibiensis in 1999. The former can actually be longer than an average Thiomargarita bacterium, but narrower than it, thus less massive. @Surayya Khatoon, our teacher taught us in 2016, while the discovery was in 1999. It is more or less equal to the diameter of ball in the tip of ballpoint pen. There’s more on wikipedia now: https://en.wikipedia.org/wiki/Epulopiscium_fishelsoni You’ll see that note the extreme size too, and give a little of the biology of these organisms.